NEW YORK -- New White House chief of staff John Kelly, in one of his first acts in his new post, called Attorney General Jeff Sessions to reassure him that his position was safe despite the recent onslaught of criticism he has taken from President Trump. Kelly called Sessions on Saturday to stress that the White House was supportive of his work and wanted him to continue his job, CBS News and AP can report. The people demanded anonymity because they were not authorized to speak publicly about a private conversation. CBS News has confirmed the call occurred. Kelly, who was appointed to the post the day before, described the president as still miffed at Sessions but did not plan to fire him or hope he would resign. Attorney General Jeff Sessions says he does his "best every day"
Mr. Trump has seethed at Sessions, his one-time close ally, since the attorney general recused himself from the probe into Russia's meddling into the 2016 election. The president viewed that decision as disloyal - the most grievous sin in Trump's orbit. That simmering anger burst to the surface last week. In an unprecedented display of a president publicly criticizing a sitting member of his own Cabinet, Mr. Trump unleashed repeated attacks via Twitter. He called Sessions "beleaguered" and "very weak" and belittled his decision not to investigate Hillary Clinton. He said he was "disappointed" in Sessions and suggested that, had he known he would recuse himself, he never would had offered him the attorney general post. And he dismissed the value in Sessions' early endorsement -- he was the first senator to back Mr. Trump -- while privately musing to aides about firing the attorney general. "We will see what happens," Mr. Trump said of Sessions' future when asked at a news conference last week. "Time will well. Time will tell." Mr. Trump is known for openly considering staffing changes without following through. Likewise, Sessions' newfound job security could also be viewed as temporary and subject to the president's whims. The White House did not immediately respond to a request for comment about the conversation. The Department of Justice also did not immediately respond. White House press secretary Sarah Huckabee Sanders said Monday that "the president has 100 percent confidence in all members of his Cabinet" and dismissed talk that Sessions or other Cabinet members could be moved. Is Attorney General Jeff Sessions' job in jeopardy? Kelly, a retired general, was brought in from the Department of Homeland Secretary to restore some discipline and stability to a chaotic White House. The outreach to Sessions appears to have been a top priority in that effort. Despite Mr. Trump's continuing anger, his allies quickly recognized the danger in attacking Sessions. The longtime Alabama senator was the forefather of many of Mr. Trump's hardline immigration policies and remains very popular among the president's conservative base. Sessions and Kelly have also been allies and traveled together to the Mexican border in April to highlight immigration plans when the chief of staff was in his former post as head of homeland security. Moreover, many Republican senators and influential members of the conservative media rushed to the attorney general's defense when Mr. Trump went on the attack last week. 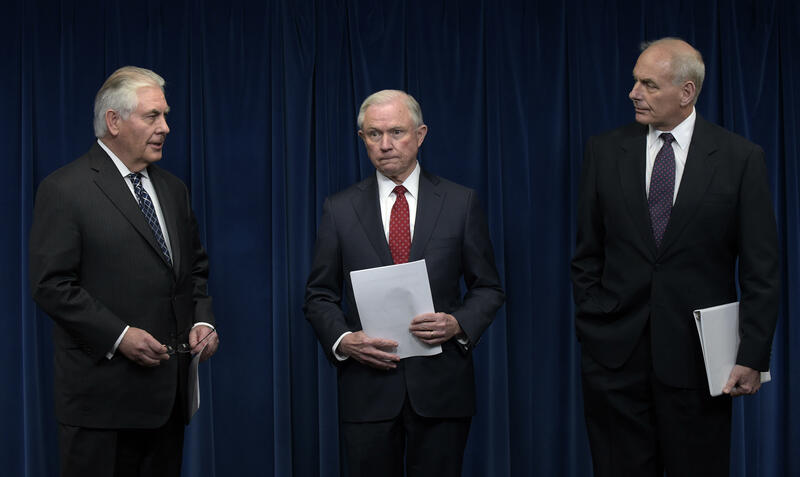 They suggested that Sessions has been the most effective member of Mr. Trump's Cabinet delivering on campaign promises, while some White House aides feared that firing Sessions could spark a significant political backlash. Instead, the White House has recently embraced some of Sessions' directives. On Friday, Mr. Trump traveled to Long Island, New York, to tout his administration's efforts to combat the MS-13 gang at the same time Sessions was in El Salvador for events concerning the same violent cartel. Though Mr. Trump did not mention Sessions by name, the attorney general told The Associated Press that he hoped to remain in the post and would serve as long as Mr. Trump wanted him. And on Wednesday, senior White House aide Stephen Miller -- a former Sessions staffer who has written most of Mr. Trump's speeches on immigration -- delivered a full-throated case for slashing legal immigration. The proposal is unlikely to become law since it is opposed by several Republican senators, yet it is popular among much of the president's base.